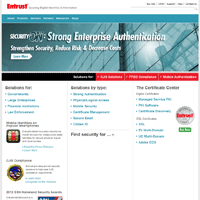 Entrust is a privately held certificate authority that sells SSL certificates, authentication, and other online security products. Entrust was established in 1994, and is headquartered in Minneapolis, Minnesota, USA. The Entrust SSL certificate reviews listed below will help you determine whether Entrust is a good company to buy SSL certificates from. The reviews have been verified to be from real Entrust customers. If you want to compare Entrust SSL certificates with certificates from other SSL providers, use our SSL Wizard. If you have ever purchased or received a certificate from Entrust, please post a Entrust SSL review to let others know what to expect. We recently just switched over to Entrust last month, and I am still amazed how smooth this process has been. I went from waiting hours or days on getting certs issued from Symantec, to like almost 1 or 2 minutes with Entrust. We should have done this years ago. I researched multiple Certificate Authorities and compared costs. ENTRUST was competitive with all other vendors and with their current special were the best price. The setup was straight forward enough and when I did have questions the technical support was great. Entrust SSL certificates are secure with flexible payment options coupled with an amazingly responsive sales and technical support teams, you are in for a good deal. Entrust makes it easy for all organisations to securely and timely launch their e-commerce platforms and products. I've worked with Entrust for two years now and the product and service they provide has been outstanding. The online resources are great and I appreciate the outreach and training they provide, as well. My organization (a hospital in Florida) has switched all SSL functions to Entrust. They have provided excellent products and support, especially in the following areas: 1. The online management website makes issuing, renewing and cancelling certificates completely painless. We can view inventory, receive notice of expiration, and track issuance in a single location. 2. Our account manager (Lisa Bosley-Kingdon) is an invaluable resource for getting information about the various types of certificates and other Entrust products. She has also handled renewals of our Platinum contract with meticulous attention to detail, and ensures we are made aware of new offerings that our Platinum contract offers. 3. Their support is capable of answering all questions asked, and resolving any issues I've come across. Their response time is excellent, and I've been satisfied with the outcome of all interaction I've had with them. Entrust has been great! We haven't leveraged it as much as possible yet as we've been pushing forward on a lot of other initiatives. However, the SMB markets' tendency to disregard local internal certs as well as just getting SSL certs functional has proven to be outdated and unconsidered. Entrust is a silver bullet that lets us not only get things up quickly, but get secure certs out consciously while being able to effectively manage our clients' SSL landscape. The support was very quick to respond when we had an issue impacting our users. Very helpful! The followup by team is good to date. When I ran into trouble and needed help, support was a quick phone call away. Issa went above and beyond to make sure I was completely satisfied and supported while securing our sites. It was so refreshing to have someone on the other side that was both technically savvy and caring to the customer. Overall, Entrust was helpful with trying to find the best solutions for our company. It was a pleasure working with David Grossberndt. Unfortunately, Entrust did not meet the needs and expectations of our company and it was more difficult for us to use than expected. Mr. Zaid was extremely helpful. His knowledge of the product and the environment in which I was installing this cert was excellent. Entrust not only provides an excellent solution for creating and managing certificates (Certificates Services Portal) as well as for scanning & monitoring all certificates (Discovery), they also give very knowledgeable and friendly support. There are a few problems during the process of SSL certificate deployment. But the team very helpful,provides quick assistance. So that I can solve the issue successfully. David Grossberndt was more than accommodating during the purchase process and was extremely attentive during out installation process. I would recommend David to all institutions needing internet security. I have been very satisfied with the support I've received from Entrust. I have been using Entrust for the past 3 years and after moving to a new firm quickly re-established my relationship so that I could streamline the process. Issa Zaid - Never gave up!!! This is great customer service. We have made Entrust our go to SSL provider and have found Entrust to be the best overall choice for obtaining and maintaining multiple SSL Certificates. The products are top notch and the Customer Service is stellar compared to any and all of our other SSL provider experiences. The ENTRUST customer support is outstanding. The website is very intuitive and there are many help /instructions available to use. The ssl process can be a challenging one, but ENTRUST is always there to help you every step of the way. I look forward to working with ENTRUST for many Years.